We are seeding Map Manager to beta testers, go to the download page to request a copy. We have a poster at SFN 2018 in San Diego, Sunday PM poster session, Program number 254.17. You can download a copy of the poster here. 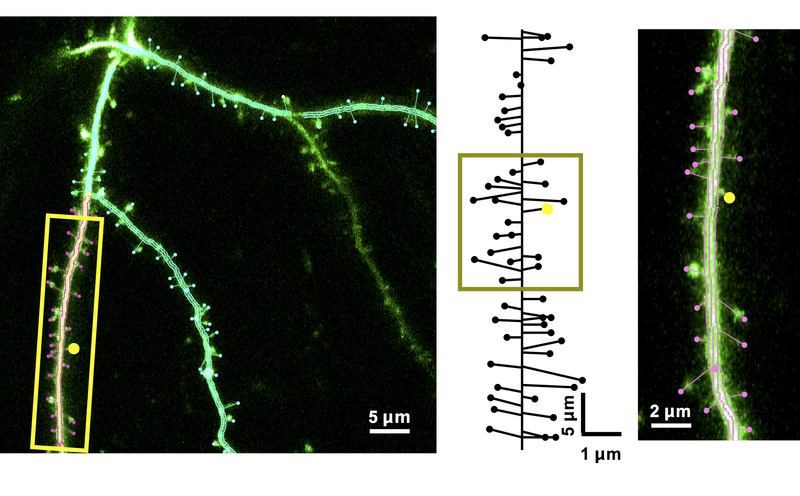 Track 3D annotations in time-series images including dendritic spines and cell bodies. Semi-automatically identifies corresponding annotations between time-points. Automatically aligns images between time-points. Designed to work with any 3D image volume including in vivo, ex vivo, and fixed tissue. Track the dynamics of 3D annotations including persistence, addition, subtraction, and transient. Trajectory analysis to track the motility of annotations. Please see the gallery for screenshots and movies of Map Manager in action. Map Manager - Matlab - A Matlab class library to load, analyze, and plot Map Manager files. Allows for arbitrary new analysis to be easily scripted. PyMapManager - A Python package to load, analyze, and plot Map Manager files. Allows for arbitrary new analysis to be easily scripted.